This week was the end of the youth baseball season in my stake at church. I volunteered as a coach this year, like last year, and I’d love to keep doing this every year forever. Spending one night a week out there helping 4th and 5th graders hold and swing a bat correctly is a pure joy. I sure see results a lot faster there than in the classroom! The kids from church are great fun to be around–kids this age always seem excited about everything, and they really give it their all. The snack stand at our field has nachos with pretty much unlimited jalapeños for $1.50, and they serve Shasta root beer and Orange Crush. Good times. Cheering these kids on–and cheering on the other team, too–just seems like a great way to spend a bit of my Thursday nights. Here’s just one more page in an epic about a life I love. Oh, and the stake sports committee gave me this candy as a thank you. So, bonus! Sports Illustrated ran this feature about 15 years ago, and posted it online last year. It’s an amazing true story of heart and community. I can’t believe there still hasn’t been a movie made of it yet. In a sleepy little Ohio community of old-fashioned Mennonites, the new high school basketball coach was, as they put it, “an unmarried black Catholic loser.” Just try reading it through to the end without choking up. When I was younger, I would have dismissed these stunts with some nerdy, smarmy snark, but as I age I appreciate physical skill more and more. Life is for living, and these guys have reached goals that are not only fulfilling for them, but inspiring and entertaining for others, as well, including me. Some of these are clearly fake, but they all make for good viewing. A great list here called, “50 Reasons We’re Living Through the Greatest Period in World History,” focusing on medical and technological advances, quite rightly. We have now basically become the gods of the ancients, able to do unimaginably fantastic things. It’s not just the lifestyle progress, though. I’m reminded of a remark the historian Will Durant made when asked what the greatest period in history was. He replied that it was today, because we have the largest inheritance of cultural experience and creations of any civilization. Which brings us back to technological progress–the Internet brings us so much of that inheritance with ease and panache. Graphic showing 35 simple productivity tips. Saved to hard drive. ‘Nevada’s best-kept secret’ offers hiking, camping and stargazing. Note to self: visit ASAP! “The 60 Most Powerful Photos Ever Taken That Perfectly Capture The Human Experience” Many of these are truly wonderful–thought-provoking and humbling. A few Saturdays ago I saw some of this event on TV. Pretty impressive stuff! The first clip is a “best of” intro, the second is a hair-raising POV shot of one brave rider! husband, and house, and lasting harmony too. “It’s fit and proper for you to know your sports. An amazing lump-in-your-throat sports story from Yahoo! It was nearly midnight on Wednesday. Doc Rivers had to go. He needed to hightail it back to Boston, where the Los Angeles Lakers are waiting to take on Rivers’ Boston Celtics on Thursday night. But that reality could wait a sweet moment longer. Right now, Doc was not an NBA coach. He was a deliriously proud dad. And he was not leaving the Dean Smith Center until he had a chance to embrace his son, Austin, after he had the basketball moment of a young lifetime. Finally, Austin emerged from the Duke locker room in sweats and walked 20 feet, back behind a black curtain, to see his family. They briefly relived the shot that became an instant classic in Blue Devils lore, the long 3-pointer that swished after the buzzer and shocked North Carolina 85-84 in one of the wildest installments in this endlessly compelling rivalry. My NCAA Tournament brackets are at left. A little early, perhaps, but I think they’re all solid. I have my local team, UNLV, beating Illinois this Friday, but then falling to Kansas on Sunday (much like last year). 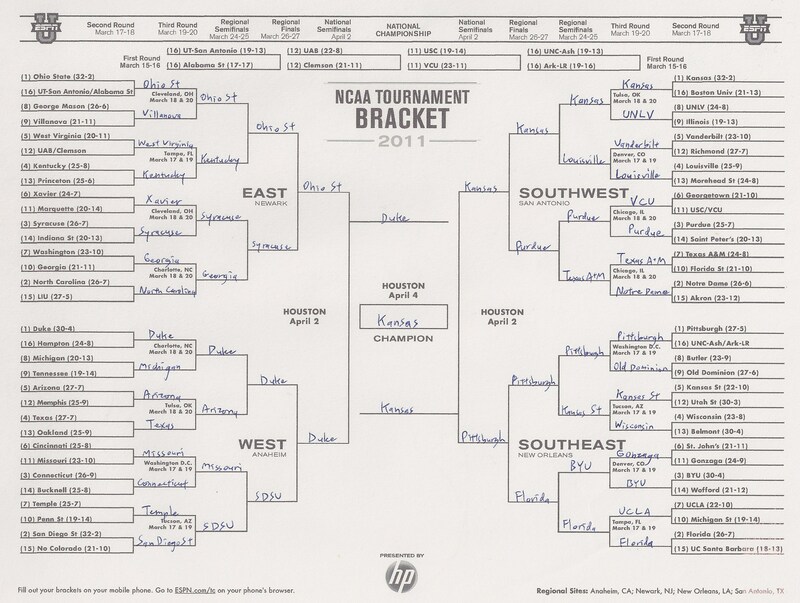 For that matter, I think Kansas will take the championship this year, beating out defending champ Duke in the final. BYU will make it to the sweet sixteen, where I predict they’ll fall to Florida. Mountain West Conference winner San Diego State will do a little better, getting to the elite eight before Duke takes them down. I got my chart here, by the way. Steve, you got your brackets to put up here? UNLV Offense: B+. I’m tempted to call it an A- here, but I don’t want to be overenthusiastic. We played above average ball, exploiting most opportunities given us and pressing our advantages to the fullest. QB Omar Clayton was dependable in moving the ball down the field; he’s consistently strong at it. Most of the time, when a quarterback can’t find a receiver and tries to bolt for what it’s worth, it doesn’t go well, but Clayton usually makes it work. Junior Michael Johnson was on fire tonight, showing up everywhere at once. He didn’t quite carry the team, but on a bad night, his performance still could’ve. He’s going to make a name for himself at this rate. On another note, one of our wide receivers is in one of my English classes, and that penalty call against him was CRAP. UNLV Defense: C+. Look at tonight’s stats–we dominated in every category, but New Mexico wasn’t too far behind in first downs. That smells like sloppy defense to me. We’ve gotten a little better over these first few games, but we still have a ways to go–if we’d played like this against a decent team, we would’ve lost. The highlight here was a second half sack of UNM’s QB that practically snapped the guy in half, and the subsequently dropped ball was picked up and run in for a touchdown. UNM Defense: C-. Swiss cheese puts up a better net than this. UNM Offense: F. This is where they were just unforgivably awful. Their receivers often seemed to be purposely trying to run into the thickest pockets of our defenders that they could find. They lost the ball so many times that I lost count–one of their many turnovers resulted from a throw that literally bounced off the intended receiver and right into our arms. It looked like a scene from a slapstick comedy. New Mexico decided to experiment by putting in a freshman as their starting quarterback. Big mistake. At one point, he threw the ball into the ground so obviously on purpose that the crowd didn’t boo so much as collectively roll its eyes. Verdict: it was fun to see us win (for a change), but beating a bad team having an especially bad night doesn’t count for much. Still, it gave us a chance to hone some promising skills. UNR beat BYU at Provo yesterday, which, no matter what your conference or ranking, is hard to do. This doesn’t bode well for our rivalry game next weekend, and history is already on Reno’s side. If we play the way we did last night against them the way they played yesterday, who would win? Hard to say for sure, but I can’t favor UNLV. But, it would be one heck of a game. That’s what I hope to see. So I spent some of Saturday afternoon folding laundry and watching the Alabama-Florida SEC championship game. After a decisive victory by Alabama, cameras showed Florida’s star quarterback, Tim Tebow, clearly crying on the sidelines. What was worse, though, was a minute later when a reporter on the field shoved a microphone in his face and asked, quote, “You just lost the last game of your senior year. How do you feel?” Did I mention he was already in tears? Dude, what’s wrong with some people? While I’m at it, I’m always annoyed at halftime when the coach who’s losing gets asked what’s gone wrong so far and what will change in the second half. They always say, “Well, they’re outplaying us and we’re going to do better.” Of course that’s what they say. What else do you expect them to say? What a dumb question. Poll: Why Are There So Many Raiders Fans In Las Vegas? Something that I’ve long found that consistently increases satisfaction in life is to have something waiting for you every day that you’ve been looking forward to. I have a few ways of doing this. The first is merely to focus on the pleasure in some of life’s smaller, frequent tasks: seek contentment in folding laundry while you watch an old movie, listen to a certain radio show during a regular commute, watch for changes in moon phases or sunrise times during that commute, or have a favorite snack you indulge in each night, for example. The second is closely related, and something that I also do to be more effective at work: put lots of routines in place. Set a schedule for working out on Saturday mornings, browsing your favorite blogs or web sites two or three nights a week, grilling burgers in the backyard while the kids run around every Wednesday evening, or getting up just a few minutes earlier to pray or do a puzzle or enjoy a bigger breakfast. Putting these things into your daily routines will also help take the edge off of those less savory events in life that aren’t always negotiable: work, confrontations, obligatory activities, etc. I got to see Saturday night’s sold out game at the Thomas and Mack, courtesy of my father-in-law. The Rebels have had only a so-so season, often playing, as R-J columnist Ed Graney said, like “a koala on Quaaludes.” Saturday night’s game started out in a familiar fashion, with BYUoutplaying on offense and UNLV looking less like a team than five random guys all playing on their own, actually seeming confused when they tried to work together. But things clicked soon enough. By the end of the first half, the momentum was strong and the second half saw a real treat for UNLV fans: Wink Adams had a great night, at the line and all around. Mo Rutledge got more indomitable the closer he got to the net, growing practically unstoppable inside the key. Tre’Von Willis also stood out, scoring solidly and sinking his fair share of UNLV’s many three pointers. Though BYU brought it up to only a one point loss, UNLV was ahead by as much as 12 at one point in the second half. This bodes well for the next stage. And so as not to write a post without any dreary social commentary, on my way home I saw a police officer texting on his cell phone. While driving. Arrrgh!